Store-bought or roasted at home; freshly cooked or leftovers; thigh meat, or breast meat. You can work in any meat (or meatless) protein options into this platter or bowl of food which is often gloriously called - salads; or simply a one-dish meal. From start to finish, this delicious and nutritiously balanced meal took only about 30 minutes to complete, with the help of good-quality store-bought rotisserie chicken from Whole Foods Market. Not only it saves time, store-bought rotisserie chicken is also budget-friendly if you regularly prepare meals for a small family of two to four. Typically, a whole roasted chicken can be used in two-three meals for a family of two. The drumsticks and wings consumed on the day itself, and leftover chicken (thigh meat and breast meat) used throughout the week in sandwiches/wraps and in dishes such as Asparagus, Cauliflower, Chicken Quinoa Bowl, and Asparagus, Chicken, Potato Bowl. Preheat oven 400F. On a baking tray, season potatoes with salt, pepper, garlic, dried herbs (oregano). Roast potatoes for about 30mins till cooked. With about 10mins remaining in roasting, set up the steamer and steam the vegetables with garlic for 5mins. 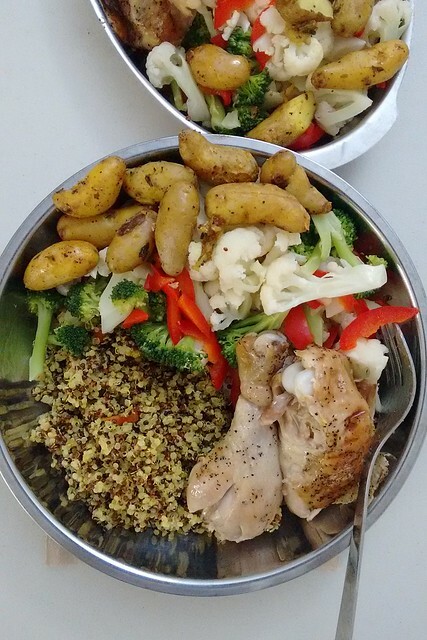 Serve garlic-steamed vegetables, garlic oregano roasted potatoes with quinoa and rotisserie chicken.